It was a case of déjà vu yesterday in Day 2 of the Mini FTOPS as, not only were the guarantees being surpassed again, but the winners looked familiar as well! The current mini-Full Tilt Online Poker Series is not just mirroring the December series in terms of guarantee-busting tournaments, many of the players who took down valuable prizes in FTOPS XXI four weeks ago are back at it in the lower buy-in tournaments. Indeed, currently atop the tournament series leaderboard is “Gennadiy AS”, who added yesterday´s Mini-FTOPS #2 PLO Hi/Lo to the Razz Event he captured in the main series. The $22.00 buy-in 6-Max PLO Hi/Lo (Mini-FTOPS #2) attracted 1,884 players – almost doubling the advertised guarantee and generating a first prize of $7,536.00 for “Gennadiy AS”. The guarantee was almost doubled again in the $109.00 buy-in multi-entry Superstack No Limit Hold´em (Mini-FTOPS #3) as 2,955 entries smashed the $150,000 guarantee and provided nice paydays for “s3c3” and “schrutebucksss” who split the top prizes in a heads-up deal. The turbo Rush Poker Mini-FTOPS #4 event was also popular despite the late start time, and remarkably the top 6 positions were all filled by European players – Laurence “whatariver1” Houghton from the UK taking home the $13,908 first prize. 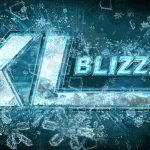 There are three more big tournaments taking place today with a total of $85,000 available in guaranteed prizes. Mini-FTOPS #5 is a $22.00 buy-in 6-Max Superstack HA tournament (alternating rounds of NL Hold´em and PL Omaha Hi) for which the cards are in the air at 11.00am ET (4.00pm GMT). There is $25,000 already in the pool for this event and sleepy-heads will be glad to know that there is late registration available for two hours. They will be “under starter´s orders” for the $22.00 buy-in Double Stack HORSE tournament (Mini-FTOPS #6) at 2.00pm ET (7.00pm GMT), with a measly $10,000 guaranteed for this event and late registration also available for two hours. Tournament of the day is the $33.00 buy-in Super Turbo Multi Entry Knockout tournament which starts at 5.00pm ET (10.00pm GMT). A $50,000 guarantee and $6.00 bounty on each player should attract a lot of interest, but do not expect Mini-FTOPS #7 to last long – players only receive 300 starting chips and levels last just 5 minutes (late registration available until the end of Level 3!). 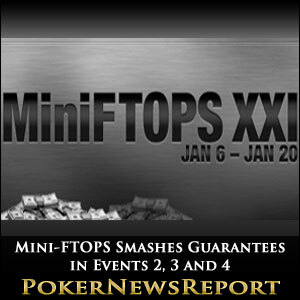 You can play in the Mini FTOPS XXI until the 20th of January at Full Tilt. For all the latest news about the Mini Full Tilt Online Poker Series XXI, results and schedules, follow PokerNewsReport on Twitter.